You’re at a party with your friends and looking for the perfect game to get drunk? DICE&DRINK is the solution! This game combines the most important features a drinking game needs: It’s fun, it’s risky and you can show your buddies who’s the boss. Play it at a house party, while queueing up for a concert or on a big family celebration. Yes, even your parents will love it. Maybe. DICE&DRINK is a drinking game where the players need to roll a higher or lower value depending on the direction of the round. But be careful: If you don’t succeed you’ll have to drink! Artificial intelligence is an important topic for video games. It can be used to simulate human-like behavior for non-player characters (NPCs). NPCs can be used to create opponents in a game or to enhance the universe of a game. Introducing NPCs in a competitive strategy game can help to improve the long time play value of the game. NPCs could, for example, be used to implement in-game events, where players have to ally to defeat an NPC. Additionally, a computer program acting like a human player could be used to perform real-life server load tests to check if changes in, for example, database queries have an effect on the performance of the game, before they go into production mode. This thesis discusses the conception and development of the first artificial intelligence for the game Grepolis. In this project, different strategies for artificial intelligence in video games, with a focus on decision making, are evaluated how good they to the game. Important questions concerning the implementation of artificial intelligence in video games are asked and answered for this project. A concept for an artificial intelligent NPC for the game Grepolis is built and implemented. Finally an evaluation is done to prove that the implemented solution corresponds to the requirements of the project. After completing the project, InnoGames has a functional artificial intelligence for the game Grepolis that simulates human-like behavior. The developed solution uses the well known decision making techniques decision trees, state machines and goal oriented behavior to create a new way of decision making. Second screen is conquering the video game scene. Big companies like Nintendo or Sony implemented such features in their latest consoles. Nintendo created the Wii U GamePad, which has an integrated display, while Sony uses the PS Vita to enable Remote Play. The problem with both of the described systems is that you need special hardware to be able to use the second screen features. Nowadays nearly everybody possesses a smartphone, which has a multi core processor. So why don’t we use the hardware, that we are carrying around with us all the time, as a second screen device? This project evaluates the use of a second screen game created with the HTML5 game engine Phaser. 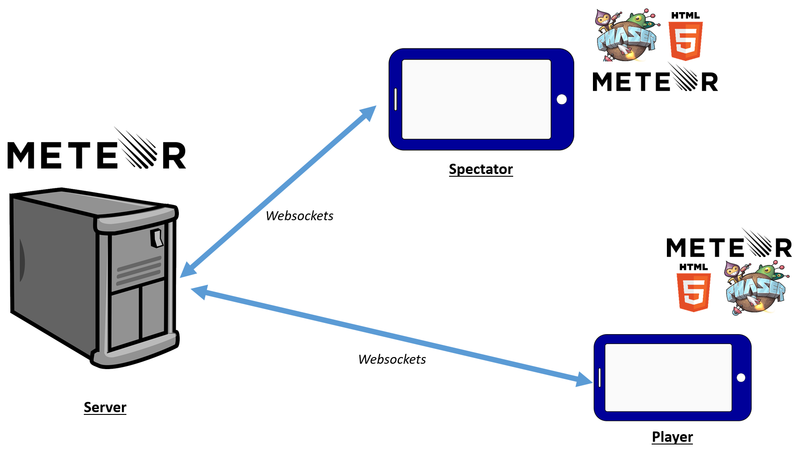 In this game the smartphone acts as the controller (Player), while an other device with ideally a big screen acts as the spectator. The game proceeds in two different phases. Every player controls a car. Each car has the abilities to ignite a nitro and to fire a blast, that is blasting the other cars in the area away. The ball as the key feature in the game needs to be hit by the cars. Each hit gives the player a point and a coin and increments the counter of the ball by one. The hundredth hit lets the ball explode and takes the cars nearby along. Exploded cars loose their points but keep their coins for the tuning phase. The level of chaos is increased by trapdoors, that are spread over the map. The trapdoor open in irregular intervals. Players, that are falling into open trapdoors, loose their points but keep their coins for the tuning phase. The bumpers, that are located in the corners of the map, let the ball rebound and ensure, that the ball does not get stuck in the corners. Speed: Tuning the speed increases the top speed of the car. Handling: Handling determines the turn speed and the acceleration of the car. Armor: Increasing the armor value improves the behavior of a car, when it is hit by a blast. Ammunition: Ammunition is the amount of blasts a player can shoot during one round. Boost: The boost value is the amount of nitro boost a player can use during one round. After twenty seconds the next game phase starts automatically. With HTML5 you have the possibility to use the hardware sensors of devices like smartphones. It is possible to get information of, for example, the accelerometer. In this project the accelerometer was used to detect a shake of the device. Another HTML5 feature, that was used was the Vibration API to give the user feedback for specific events. Unfortunately HTML5 is not supported equally by all browsers. The Virbations API, for example, is not working on the Safari Browser for iOS devices. This leads to an inconsistent game behavior on different devices and can only be solved by finding exceptions for not supported features. But it can be assumed that the support for HTML5 features will improve with every upcoming browser update. The game is presented in a cartoon style and uses an isometric projection as the perspective. The isometric projection enables a visual representation of three dimensions where technically only two dimensions are possible. The car was created with the 3D graphics and animation software Blender. A turnaround was animated and exported as single frames. Those frame where combined to a sprite sheet with the tool Texturepacker. Since the game is playable with up to 30 players it is necessary to have 30 different colored cars. The car was exported in grayscale and later on tinted dynamically in the program code. Other game elements like the traps or bumpers where animated using Adobe Flash and also packed to a sprite sheet with Texturepacker. To complete the cartoon look a font was created and could be used as bitmap text in the game. ConnectiDot is an addicting little brain jogging game to distract yourself from the daily routine. You have to connect the dots with the same color by swiping over them. Connected dots will disapear and new dots will come up if you make chains with more than 3 dots. But hurry, because time is running while you are playing!